You’ve probably determined by now that we like fairly spicy food. So, when I ran across an idea to incorporate bacon and jala jala’s into deviled eggs, I thought the idea sounded fab! And I try new things at strange times of the year – for example, I believe I first made these at Christmas. 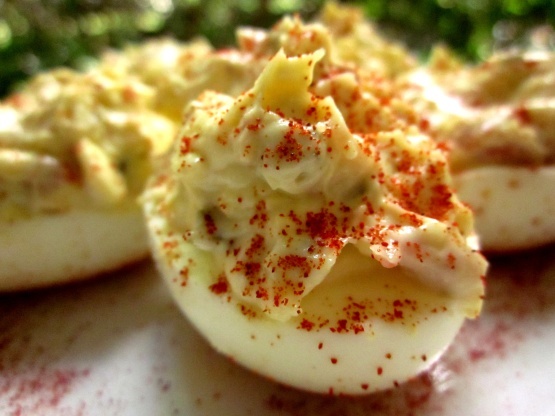 I think most normal people make deviled eggs for picnics or in the summer – not me! I cook things when the mood strikes! With the 4th of July festivities approaching quickly, I thought this would be a great time to share. One trick that you already probably know, when boiling eggs, is once they have finished the process, place them in cold water. This makes the egg shell much easier to remove. I actually continue with the cold water and then promptly remove shells. Mix all ingredients together, then stuff your eggs. I also like to sprinkle a little paprika very lightly for color when all finished. Refrigerate until ready to eat. Yum! Cook eggs, peel, slice in half and remove yolks. Combine all ingredients and stuff eggs. Listen, I’ve had a ton of Mexican cookbooks that found their way to a garage sale or some other demise. If I have never heard of the ingredients that are in a recipe, probably not going to happen. There’s a lot of peppers and spices, etc., that would be really good, but I don’t have time! So, I ran across this recipe for homemade enchilada sauce and it is sooo good. And EASY. And, I’ve even frozen it. Imagine delicious mexican food/enchiladas, and I think you can be with me on this! It takes no time and is a lot better than the canned stuff. So, check out the recipe below, and thanks for reading!!!! In a medium saucepan, heat the oil over medium-high heat. Add onion and cook until softened. Stir in the flour and cook for 2 minutes. Whisk in 1 1/2 cups water and the tomato sauce, chili powder, cumin and salt. Bring to a boil and simmer for 5 minutes. Summer is a fantastic time for apple pie. Well, actually anytime is good for apple pie. 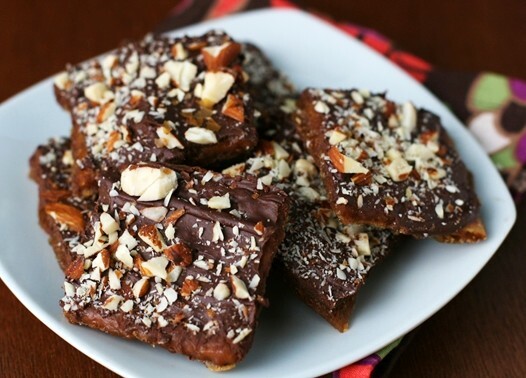 This recipe appeared originally in a Taste of Home magazine (credits below). Although it sounds a little weird and complicated, it’s really simple and your guests will love you forever! Start with a 9” pie plate and coat it with cooking spray. Line the pie plate with parchment paper, and coat IT with cooking spray. Now I’m not going to share how to make a pie crust. I’ve NEVER made one and don’t intend to start now. 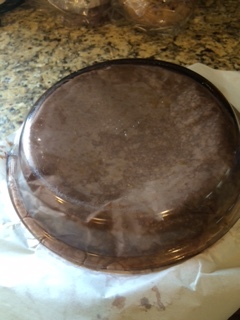 I good friend, Jeannie, gave me a wonderful pie plate and the recipe for crust for a wedding present, but I gotta tell you, that pie plate has made many dishes but never a pie. (sorry Jeannie) The boxed ones are so simple and fit into my life WAY better! Combine your brown sugar, butter and pecans and sprinkle on parchment paper (told you this a little odd). You can use either halved pecans with the round side down, or chopped, whichever you have handy and prefer. Take one of your handy, dandy pie crusts that have softened, and press into bottom of pie plate, against pecans and up the side. Trim crust. 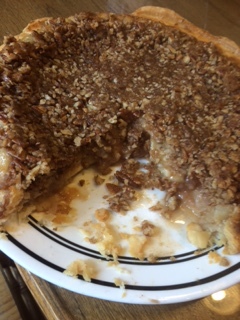 Crust pressed against pecans, ready for apple mixture! 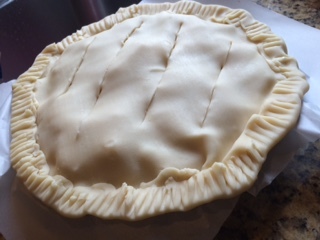 Combine remaining ingredients, throw in your pie plate, top with crust, seal edges and slit the top. You’re ready to roll, and closer to Upside Down Apple Pie. Once your hot dish of deliciousness is done, loosen parchment paper around the edges, flip ‘er upside down on serving plate, and let it cool while you get out your fine china (paper plates.) Serve with or without ice cream. Yum Yum Yum. I hope you enjoy as much as we do. Making this for the kids and in-laws tomorrow. 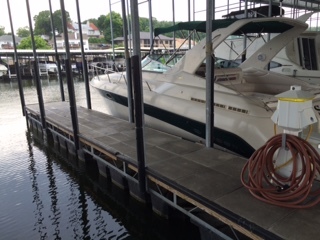 I think they will be happy happy! 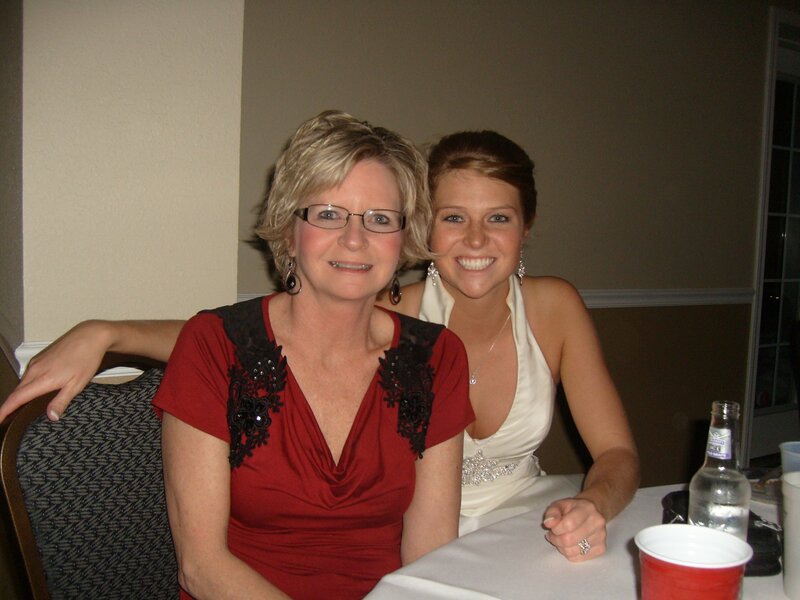 Thanks Becky Berger, Deerfield, Illinois for this delicious recipe! Preheat oven to 375 degrees. Spray pie plate with cooking spray. Line plate (sides and bottom) with parchment paper. Spray parchment paper with cooking spray. Combine pecans, butter and brown sugar. 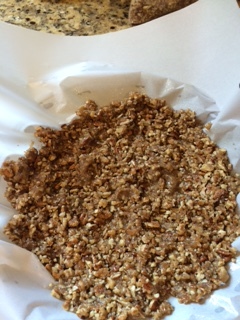 Line bottom of pie plate with pecan mixture. Trim edges. Assuming your boxed pie crust is softened, place over pecan mixture, pressing firmly against the pecans and sides of pie plate. Combine filling ingredients and place in crust. Trim edges and seal crust. Cut several slits in top of pie crust with sharp knife. Place a foil lined baking sheet on the rack below the pie to catch any spills. Bake for 60-70 minutes or until golden brown. Carefully loosen the parchment paper and invert on serving plate. Let cool for 15 minutes before serving. I am sure you all have your favorite brand of saltine crackers, but we are cracker snobs, just as I shared that I’m a Hellman’s mayonnaise snob. ZESTAS. They are the total bomb. I used to think that they are all the same, but at the Beene ranch, we consume Zestas. (they really should sponsor me or something). So back to the chocolate treats. I don’t always toast the pecans when the recipe dictates, but in this case, I really do recommend it. You get a much deeper, nutty flavor. Just be super careful that you don’t burn them. Oh so yummy, and you will never believe they are saltine crackers! I am really pumped up because all the kids will be in my casa this weekend, so I plan to make some for them to take home. The votes are currently out to them as to what they want for their home cooked meal, so I don’t know what that looks like now. However, I’ll probably brew up several favorites! Enjoy! Preheat oven to 350 degrees. Line 15 x 10 x 1″ pan with foil, and spray with nonstick cooking spray. Arrange saltines in single layer on foil, keeping them as close together as possible. In large heavy saucepan, melt butter and stir in brown sugar. Bring to a boil; cook and stir until brown sugar is dissolved – about 3 to 4 minutes. Spread evenly over crackers. Bake 8-10 minutes or until bubbly. Immediately sprinkle with chocolate chips and allow to soften for a few minutes. Spread over top with a spatula. Sprinkle with pecans and allow to cool briefly. Refrigerate, until set. Break into pieces and store in airtight container. To toast pecans: Place chopped pecans on baking sheet and bake at 350 degrees for 10-15 minutes until lightly toasted, stirring occasionally. Taco Seasoning – your way! I’m way way far removed from being a health nut. However since we eat a lot of Mexican food, and therefore I purchase a lot of taco seasoning, I looked around to see how to make my own since I don’t really like the packaged flavor. There’s a whole bunch of crap in packaged seasoning, so I figured I had nothing to lose if I just made my own. Result: yum! 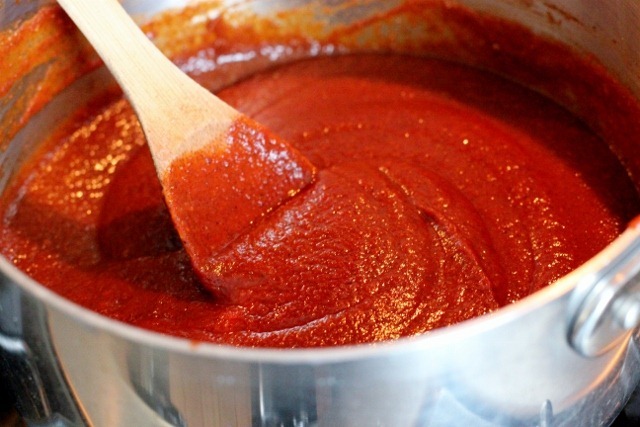 FYI – I have a really delicious simple recipe for enchilada sauce I’ll share soon! You can add heat as you desire, but this is really good, and lot cheaper if you love Mexican food as we do! Whisk all ingredients and store in airtight container. I love love love grilled pineapple – it brings out the sweetness and flavor. Oh so yum. We tried grilled watermelon in salsa last year, but I wasn’t a fan. 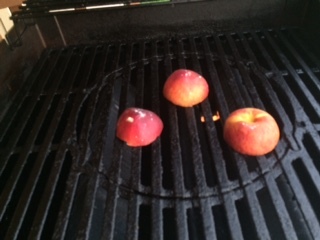 HOWEVER, you take a peach, throw it on the grill, dress it up and WOW. It will knock your socks off, if you happen to be wearing any. Gab and Gen here to assist (and taste)! We then added a little spray of fake butter, and sprinkled on some brown sugar and just a touch of cinnamon. 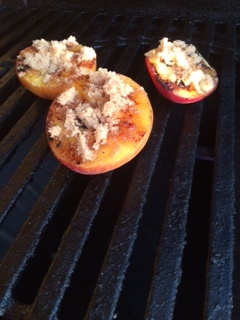 Back to the grill, my little delights! Close the lid with the grill off and let the brown sugar melt. We brought our little gems in the house, drooling. DELECTABLE. 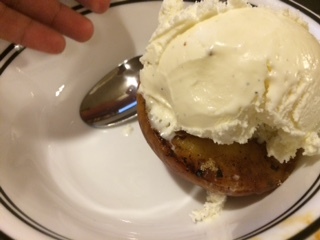 We thought MB might like them with a spoon of ice cream, and, well, no words to explain it. 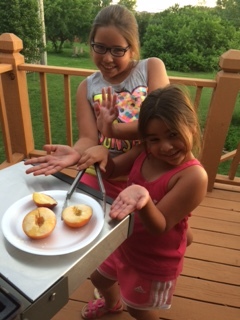 They are really good without the ice cream – that’s how my helpers and I ate them. I’ll be making this at the lake this summer. Nothing easier and more delicious! 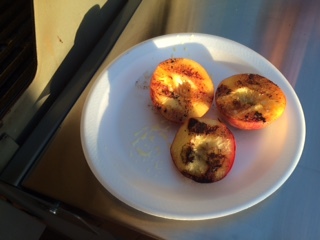 Cut peaches in half, and remove pits. Oh yeah, you might wanna wash them also. Brush or spray with butter, and place on low temp grill, face down. Grill until soft, but not smushy. Sprinkle about a TBSP of brown sugar in the well of the peach, and around the top, and then lightly add a cinnamon sprinkle. Back to the grill, face up with grill off. Sugar melts and delish! Eat as is, or serve with vanilla ice cream.